Before founding Meyer Davis, Will Meyer worked for architect Gwathmey Siegel, and Gray Davis worked for designers John Saladino and Thomas O’Brien. Dan Shaw is founding editor of the New York Times Style section. Interior designer and writer David Netto is a contributing editor to T: The New York Times Style Magazine. "Made to Measure gives the designers' prolific portfolio the print treatment with a 272-page volume that showcases projects all around the world. The tome is a visual feast for lovers of design and proves that whether it's a mansion in upstate New York or an Oscar de la Renta boutique in London, the two men's commitment to their craft is always top-notch." 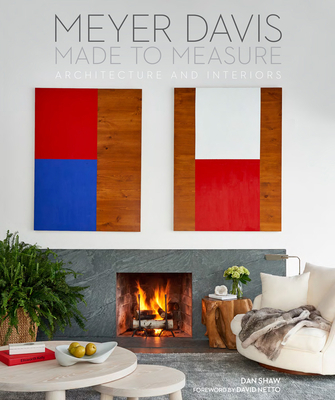 "Will Meyer and Gray Davis have made a name or themselves by creating inviting interiors that feel at once structured and relaxed, making use of an array of materials while maintaining a clean, modern feel. . . . the firm's new book, Made to Measure, neatly summarizes the warm, tailored, and always personal interiors that have earned their firm its devoted following." "There's design take-away on every page of this stunning coffee table book, a tribute to the work of fearless modernists Gray Davis and Will Meyer. . . . Through the pages you'll get a lesson in what it looks like to have a home that is curated and collected, even if someone else did it for you." "From South Beach to SoHo, architects Will Meyer and Gray Davis have designed more than 200 residential, retail and hotel spaces that epitomize hip luxury style. This retrospective of their work, with text by Dan Shaw, showcases their sophisticated style."